An old friend once declared that we should call ourselves visual communicators. The thing is, we aren’t. We build tools for improv actors – brands – capable of moving the very cultures they draw from. 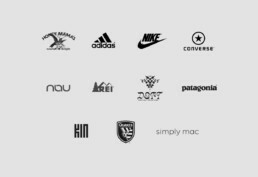 As designers, we see and demonstrate that a brand’s benefit is ultimately found in a participation borne from riffs off cultural artifacts, a little art history, clear hierarchy, purposeful rhythm, our client’s intent & desire mixed with our own designerly obsessions (and complexity, depth). At our best, we create things & experiences that meet and challenge their audiences at the same time. More than surface treatment, our work should always be relevant, and a little ahead of the game. That creative risk keeps things exciting and, of course, means that the brands we create for participate in creating their own culture. Which means we help them participate in creating their own context. Which means we are involved in creating life. I have been (and still am) a designer, art director, creative and design director. I’ve designed typefaces, taught typography and given talks on the same. I’ve worked on a wide variety of work from huge identity launches to seasonal campaign concepting and execution, retail installations and one-off events. I’ve created for interactive (online, e-com and brand sites, custom interactive installations and mobile apps) from concept, through UX, design, final QA and launch. It’s the studio atmosphere, along with the right talent – that makes good work possible. So the direction and quality of the work are as much about developing and driving concepts that serve our clients as much as guiding and mentoring the studio attitude toward that work. A stronger team takes better risks.